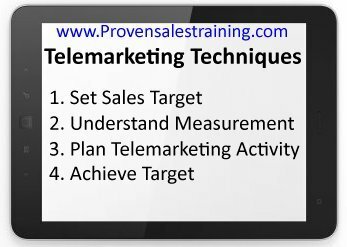 The telemarketing technique on these pages will help small businesses and self employed people to set sales targets and achieve them by calculating the supporting telephone and cold calling activity. Understanding and setting a sales revenue target. How to calculate all the performance measurements that will help you to plan for your success. Knowing how much cold calling and telemarketing you need to do to achieve your target. Planning how many sales leads your marketing needs to generate. How many sales appointments you'll need to close enough sales to hit your small business target. On this page we start by setting a new business sales target based on your needs. What would be an achievable overall annual revenue from sales for your business for the next 12 month? What's the sales revenue figure that you need to earn to keep your business going? Start by calculating a figure that includes revenue from both existing customers and new business. Are you looking for a huge increase above your current sales revenue, and are you willing to put in the extra work to make that happen? Maybe owning your own business, or working for yourself, was a lifestyle choice so your targets will be focused on earning what you need in a way that suits your life goals. This could be efficiency over profit and freeing up more of your time. Or your goal for your business could be to gain a big financial return. Wherever your financial goals for your small business are on the scale of lifestyle versus income you should take that into account when setting your annual sales revenue target. Do you want more free time or more income? Once you have your target you can plan your telemarketing technique to achieve it. So what is your sales revenue target for the next 12 months? The right balance of profit v lifestyle. Realistic compared to current results. Achievable, with targeted actions, within 12 months. Got it? Have you know got a specific sales revenue target for the next 12 months? Do a quick sense check on your sales revenue target. Does the revenue figure cover your cost and still give you the level of profit that you want? Can you cover any additional expense related to an increase in business? Will an increase of 50% on current sales figures mean a 50% increase in time and effort from you? Is that increase possible and are you willing to do it? Once you have a target that you're happy with we can move on to deducting revenue from existing customers and that will leave you with a target for new business over the next 12 months. With that figure you can plan your telephone calling and telemarketing technique to help you to achieve the target. What if your business relies on revenue from both existing customers with a regular spend and new customers. Calculate the expected sales revenue from your current customers over the next 12 months. Take into account customers you may lose by looking at attrition rates for the past 12 months, and add any expected increase in revenue from existing customers. Deduct this total, of expected revenue from existing customers, from the sales revenue target you decided upon earlier. Now you have your new business sales revenue target for the next 12 months. But first let me ask you, have you calculated accurately your revenue from existing customers for the next 12 months? If your business is based on selling contracts for your services, or repeat orders from existing customers, you can use the rule of 78 to accurately forecast the expected sales revenue from these customers. If you sign up a similar customer in February they will contribute a spend of £1,100 to your business for that same year because there are only eleven months left in the year. A new customer in March will contribute £1,000 revenue that year and one in April £900. If you acquire a new customer each month, spending £100 a month, over the year you will have £7,800 additional revenue coming into the business. (78 x monthly spend) You can use this calculation to forecast revenue from existing customers and make sure your new business sales target is accurate.